Production has got underway on a follow-up to acclaimed RTÉ craft series, ‘Hands’. 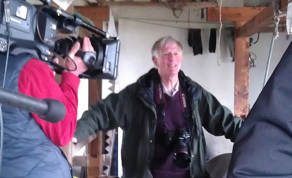 GMarsh TV productions are just over one week into a seven-week shoot in various locations across Ireland on ‘In Good Hands’ which will revisit some of the crafts featured in David and Sally Shaw-Smith’s multi-award winning series of 37 documentaries for the State broadcaster. David Shaw-Smith is involved in the GMarsh TV productions’ revisit, which will run over six episodes and is BAI funded. Frank Delaney will direct, while Mairead Tucker and Gillian Marsh are the series’ producers. Richard Kendrick (Saving The Titanic) is shooting it, while Phil O’Reilly is on sound. The series will be broadcast on RTÉ One. No broadcast date has yet been announced although it is likely it will be late this year or early next year. GMarsh TV productions are due to deliver the series to RTE in October. It will be edited by McMahon. ‘Hands’ was made for RTÉ during the 1970s and 1980s and captured traditional rural and urban life in Ireland. It has been re-broadcast numerous times over the past 30 years. The original ‘Hands’ saw Dublin-born filmmaker David and his wife Sally travel Ireland recording personal films of craft makers and the crafts they practised. It featured more than 40 different traditional Irish crafts, from the weaving of crioses (colourful woollen belts) and the creation of harps and drystone walls, to the making of pampooties (moccasin-type shoes). ‘In Good Hands’ will follow-up some of the crafts featured throughout that series and is currently shooting in Tullow, Co Carlow, having last week visited Ardara in Co Donegal. The production will also visit Co Kildare where it will shoot in Tutty’s shoemakers in Nass and Berney Brothers Saddlery in Kilcullen. It will also visit Beleek Pottery in Co Fermanagh and a metal foundry in Newrath, Co Waterford. Speaking to IFTN, Gillian Marsh said: “We’re revisiting some of the crafts to see if they’re still going or what’s happening. It’s a revisit of ‘Hands’ but it’s also a look at where these crafts are in Ireland and where craft is.